Sen. Marco Rubio and Rep. Cheri Bustos will be in Normal on Monday, Oct. 29, 2018. U.S. Sen. Marco Rubio, a Florida Republican, will be in Normal on Monday night for a watch party for GLT’s debate between Davis and Londrigan. It’s their final debate before Election Day. Davis endorsed Rubio during the 2016 presidential primary, which Rubio lost to Donald Trump. On Monday afternoon, Londrigan will be joined by U.S. Rep. Cheri Bustos, a rising star in the Democratic Party, for an early vote rally at Illinois State University. The Bloomington-Normal appearances from Rubio and Bustos signal once again the importance of the 13th Congressional District in the balance of power in Congress. 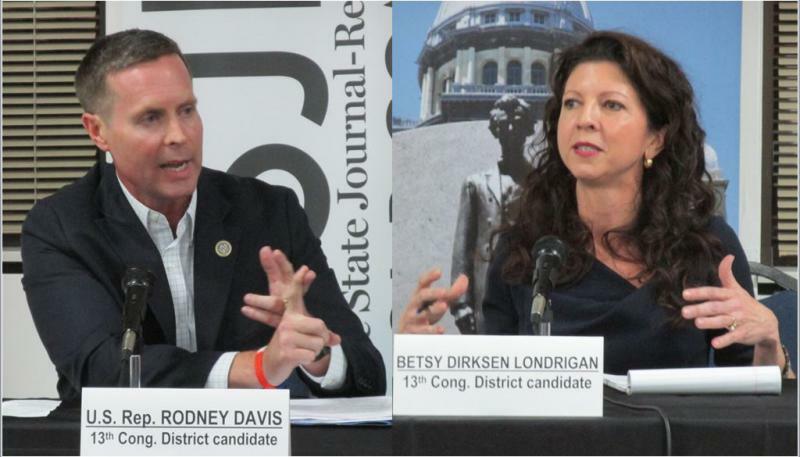 Davis is a top Democratic target as they try to win two-dozen seats and retake the House. Analysts say the 13th District leans Republican, but it was drawn specifically by Democratic lawmakers to give Democrats a chance.